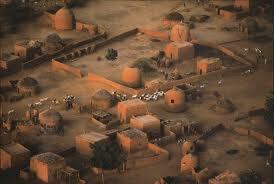 Niger has a very large population of 15 million people mostly living in the south and west regions of the country. The most populous ethnic groups are the Hausa and the Djerma-Songhai, who make up more than half of Niger's population. Both groups are farmers that live in the southern part of Niger. The remainder of the population is made up of nomadic and semi nomadic people including Toubou, Arabs, Fulani, Kanuri, and Tuareg, and most of these groups raise livestock. Niger has a very high fertility rate, one of the highest in the world, averaging to about seven babies per woman. Located in West Africa, the country of Niger is bordered by Benin and Nigeria to the south, Mali and Burkina Faso to the west, Libya and Algeria to the north, and Chad to the east. This landlocked country is West Africa's largest nation in size, almost 789,141 square miles. 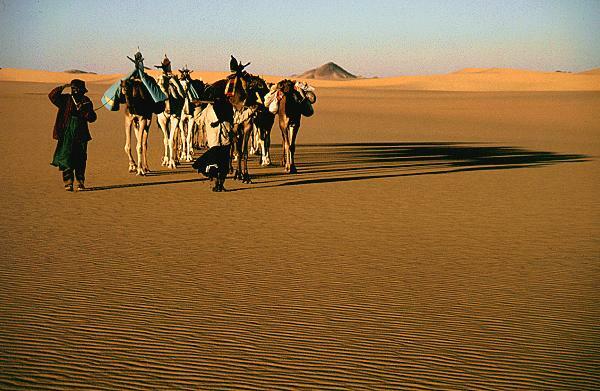 The Saharan desert covers more than 80% of Niger's land, so it is no surprise that Niger is one of the least developed and poorest nations in the world. Niamey, situated on the east bank of the Niger River, is the capital of Niger and the country's largest and an economical, administrative, and cultural center. 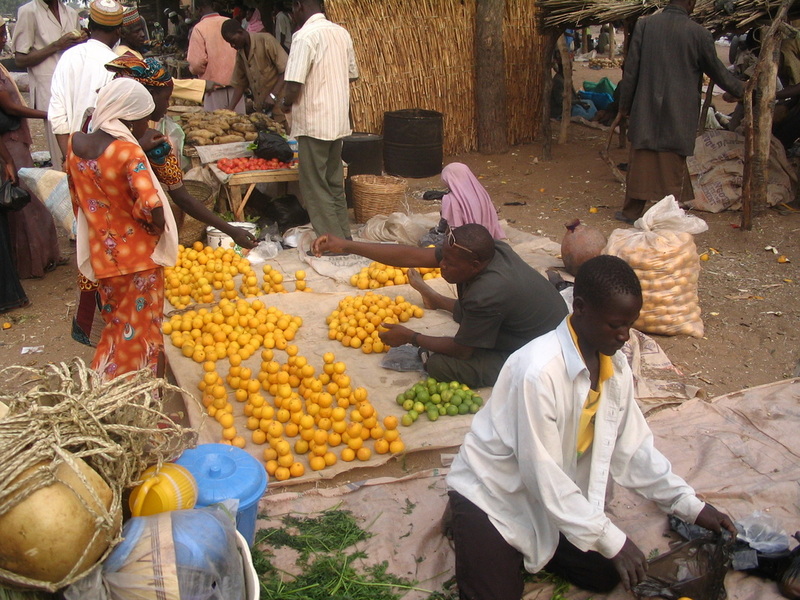 The city of Niamey manufactures ceramic goods, cement products, weaving materials, and bricks, and the primary export product is uranium ore. Niger's agricultural exports come out of the fertile southern portion of the country. Most of Niger has an arid climate, since 80% of the land area is the Sahara desert, however the land to the south has a more tropical climate. 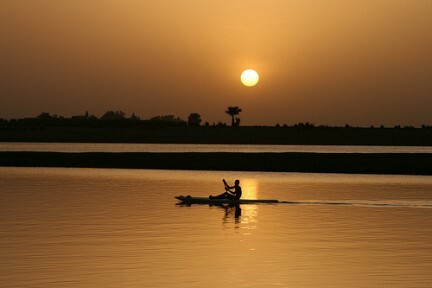 The Niger River is the country's lowest point of elevation, only one tenth of mile high, and the highest point in elevation is in the Air Massif at Mont Idoukal-n-Taghes, roughly one mile high. Temperatures can reach as high as 110 degrees Fahrenheit in the summer time, and can get as low as 60 degrees Fahrenheit during the winter. Rainfall in Niger is mostly in the months of July and August, the highest average seen is about eight inches in August. Today's Niger is mostly desert land and inhospitable to live in, but five thousand years ago, the country was a lush grassland area. Pastoralist populations have left paintings dating back thousands of years depicting abundant wildlife and fertile ground. Evidence has been found that humans have occupied Niger for many thousands of years. Around the fifth century, Niger began trading such items as ivory, gold, beads, and metal goods to Egypt and Carthage. During the nineteenth century, the Europeans first came to explore the country looking for the mouth of the Niger River. Niger became a French colony in 1922, but in August of 1960 the Nigerian National Assembly declared the country's independence. There have been many ups and down for the country of Niger and many coups have been attempted, so over the years the country's economy has slid and declined, but has still held on. The country of Niger has several points of interests to see. The Grande Marche in Niamey is the town square with streets filled with people and merchants selling goods outside. Shops and markets are located in this plaza and it's a good place to see a good sampling of the local food and produce the country has to offer. Restaurants and cafes are scattered here and there in this part of town. Fish markets are also in the plaza offering local fish for sale. Located in the city of Zinder is the Regional Museum, a small structure with only two rooms, but they are filled with items and furnishings of the Hausa culture and show its history very well. The National Museum of Niger is located in Niamey, and shows a great representation of the Nigerian culture and history, and includes a library with a variety of artifacts and paintings. 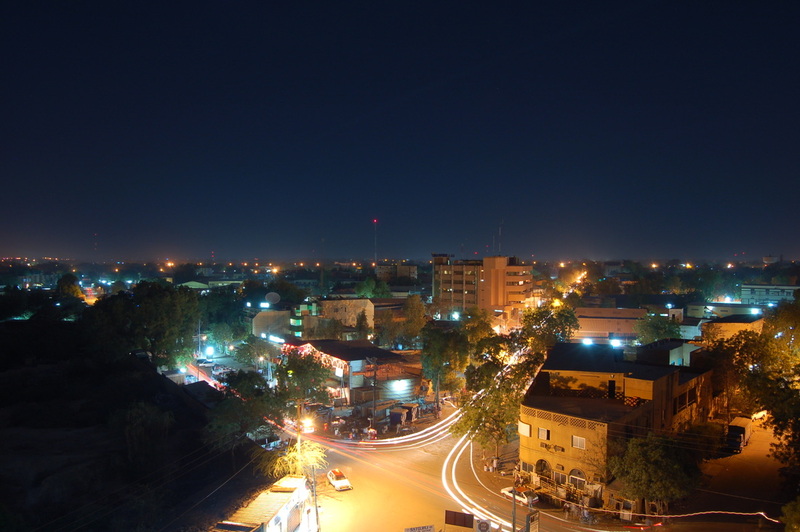 The more developed cities of Niger have a pretty active nightlife. Disco clubs, bars, and restaurants all offer late night activities for your enjoyment, and many of the hotels in Niger offer their own clubs. Some hotels even include their own discotheques so people don't have to worry about being too far from their hotel room and can still enjoy a night of fun. You may enjoy an evening walking tour to visit local shops and markets that stay open late and enjoy the night air and watch the local people. More than 90% of Niger's population follows the Muslim religion. The other 10% follow the Christian or Animist faiths. The Christian and Animist communities are a result of the missionaries that were sent by the French as well as European and West African expatriates. A part of the Niger culture is the holding of festivals. These festivals are generally very colorful and full of music. These festivals incorporate a display of ancient ancestral art and ancient Niger weapons that can also be seen in museums. The cultural heritage of Niger is preserved in various cultural centers around the country. The cuisine of Niger is that of most traditional African cuisine with European influences. Meat is usually cooked over a hot coal grill that brings out the lush flavors of the meat. Both beef and mutton are very common among the Hausa people, as well as the nomads. One of the specialties of the nation is called foura, incorporating small balls of ground millet, slightly fermented and crushed with milk, spices, and sugar. The national drink of choice in Niger is hot tea, so it is very easy to find. Beans are a main part of Nigerien cuisine, along with locally caught fish and locally grown vegetables. Spices are added to meals to give the food some extra flavor, and a variety of vegetables are used to add some color to the dishes. Traditional dishes revolve around rice, millet, and a type of bean called the niebe.